Standing in line for a Friday night screening for To Rome with Love, I was asked what film I was waiting for. Without much thought, I misspoke and said Midnight in Paris – well, at least I got the director right. But that kneejerk response falls in line with my feelings for To Rome with Love and Midnight in Paris – the former lacks the lasting resonance of the latter. Even now, as I’m reflecting on Woody Allen’s latest European escapade, I’m finding it difficult to highlight any particular aspect of the picture. On that same note though, the picture’s formal competency makes the film agreeable without ever really impressing. Allen strings together a quartet of narrative threads with middling results. The most promising of the bunch features Jesse Eisenberg as an architect who finds himself embroiled in passion with his girlfriend’s actress friend. The odd choice of having Ellen Page star as a sexual vixen while having Greta Gerwig function as the sidelined girlfriend is one of Allen’s more egregious missteps, but the general direction of this vignette is entertaining. It’s largely due to the chemistry between Jesse Eisenberg and Alec Baldwin. Baldwin’s role is particularly noteworthy as it’s the most ambiguous idea that Allen plays with in To Rome with Love. Eisenberg and Baldwin’s relationship tiptoes between fantasy and reality without ever truly siding between the two. Another plot addresses the conceits of misappropriated celebrity (featuring Roberto Benigni). A third involves a case of mistaken identity that utilizes the tourist sights of Rome to great effect. And a final plot involves Allen himself as a retired music producer who discovers that his future son-in-law’s father has a gifted voice… only when in the shower. None of these narratives intersect with each other, and most interestingly, operate under different time frames. This is one of those rare cases where the different segments work best on their own terms as opposed to working as a part of the larger narrative framework. Allen’s arbitrary cutting between each plot line doesn’t do the picture many favors, but the material is so light and inconsequential, that it really doesn’t hinder its effect either. 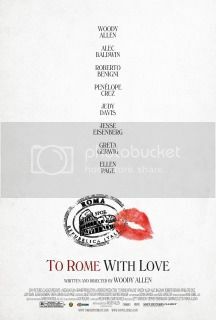 To Rome with Love falls in line with Allen’s 2010 effort, You Will Meet a Tall Dark Stranger. Both pictures rely on various narrative threads to address its larger thematic elements. But To Rome with Love is cleaner, lighter, shot more effectively, and just better than Tall Dark Stranger. The film is frivolous entertainment that packs the emotional weight of a postcard. What typically happens when receiving a postcard? It’s appreciated at the moment, stored away, and slips away in your memory.